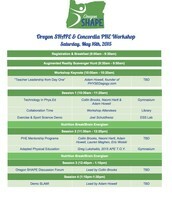 Oregon is using Smore newsletters to spread the word online. Hey everyone, I hope your year is winding down well. 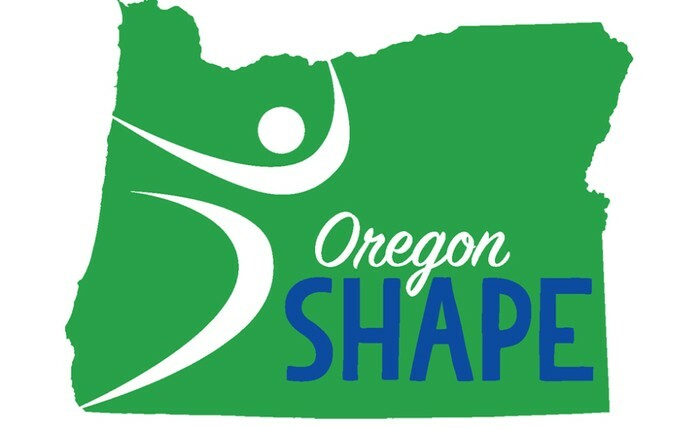 I wanted to take a moment to remind you that this weekend is our first annual Oregon SHAPE Workshop at Concordia University. This should be a really awesome opportunity to meet up with colleagues and get some fresh ideas for the end of the year. A big part of this workshop will be giving you time to apply what you learn, so expect to have lots of opportunities to do some hands on learning. A big thank you to SPARK Programs, and Trader Joes for their donations so we could offer free breakfast and nutrition breaks. Also, a huge thank you to Concordia University for hosting our workshop. Read below for more details regarding the schedule. 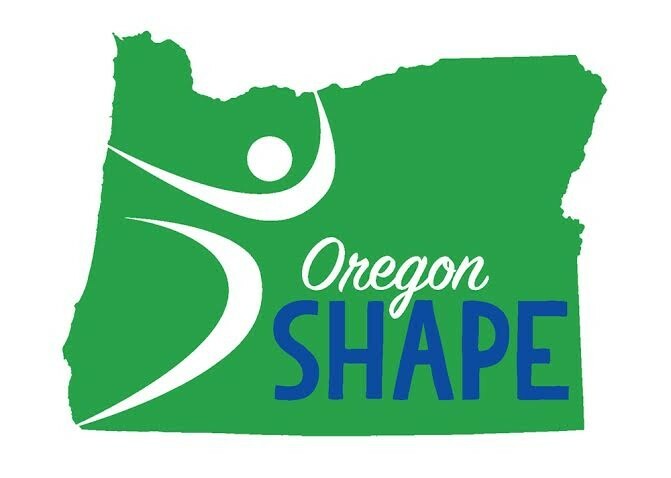 This Saturday is Oregon SHAPE’s free workshop. If you haven’t signed up please do so by RSVP'ing below. Here is a link to the schedule. This should be a great time to recharge the teaching batteries at the end of the school year. 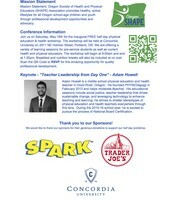 We plan on having some great sessions centered around teacher leadership, integrating meaningful technology in physical education, mentorship and more. 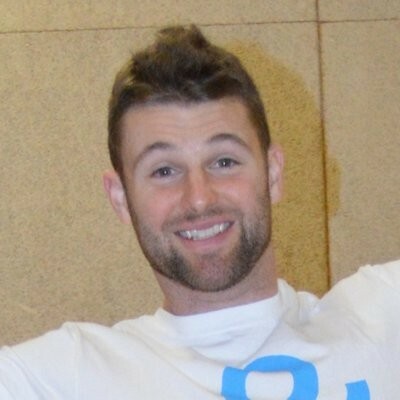 Adam Howell, founder of PHYSEDagogy.com, will be keynoting the workshop and we have Greg Lukshaitis, the 2015 National Adapted Physical Education Teacher of the Year, running an awesome adapted session. Join us at 9:00am for a complimentary breakfast! We would like to congratulate Greg Lukshaitis on recently being named the 2015 National APE Teacher of the Year! Here are a few great articles on Greg and his prestigious award. 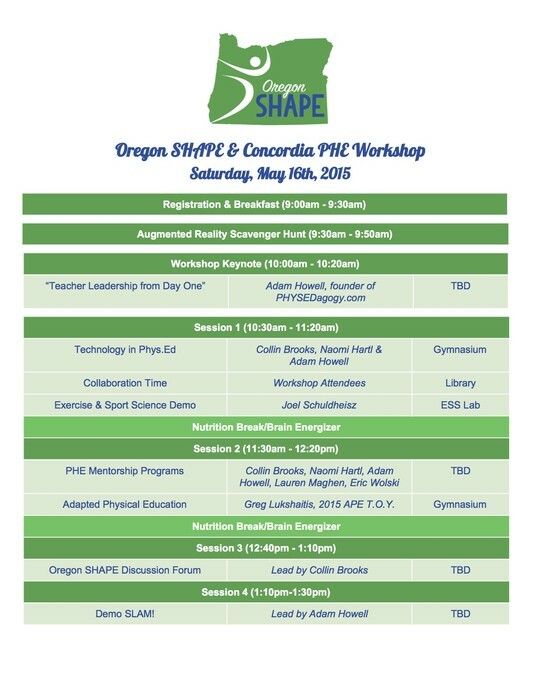 On April 8, physical education teachers in the Hood River County School District should have celebrated. The US Senate announced bipartisan legislation that aims to classify physical education as a core subject in the reauthorization of the Elementary and Secondary Education Act (ESEA), otherwise known as No Child Left Behind (NCLB). This is significant because it would allow federal Title funds to be spent to support physical education. 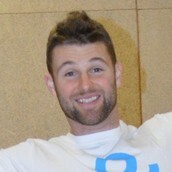 Unfortunately, April 8 was a dark day for physical education in HRCSD. Superintendent Goldman estimated an $896,000 reduction in funding as we plan next year’s budget. This is not Goldman’s fault as he has advocated tirelessly for more funding than the $7.235 billion approved. In a letter to staff, potential cuts could include elimination of K-5 physical education and reductions to 6-12 physical education. This would be short-sighted and awful for kids. The benefits of daily, quality physical education (QPE) are numerous in improving academic and behavioral outcomes. Emerging brain research is summarized in the books SPARK by John Ratey and Brain Rules by John Medina; they both demonstrate the impact QPE has on the whole student. We now know that QPE sets up students to be more successful in the classroom by boosting cognitive function. This is especially true with literacy, one of the district’s priorities. State Average (minutes/week): 3rd grade, 71 minutes; 7th grade 163 minutes. Hood River County (minutes/week): 3rd grade, 33 minutes; Wy’east Middle, 150 minutes; Hood River Middle, 78 minutes. HRCSD is far behind the rest of Oregon in recognizing and prioritizing the value quality physical education has on improving outcomes for students. If Excellence, Every Student, Every Day is what we aspire to, eliminating physical education is not the way to do it. Written for the Hood River News - Letters to the Editor for April 15th. 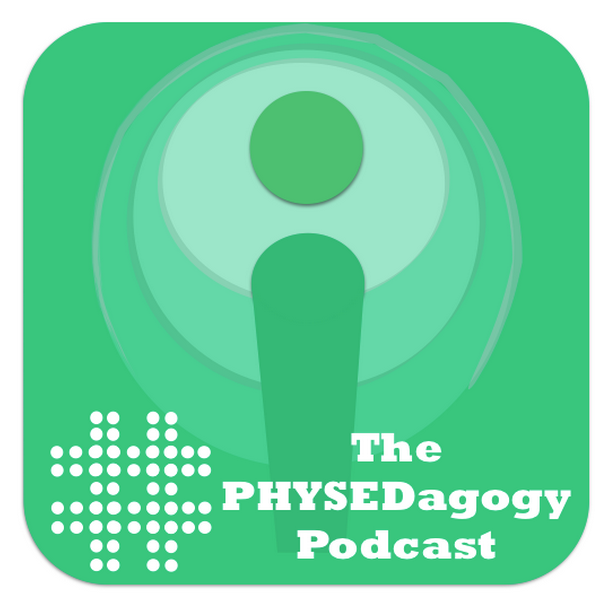 Whether you are a physical education teacher in the Northwest or anywhere else in the world it can be hard to get connected with others. Sometimes as physical educators we may even feel isolated. 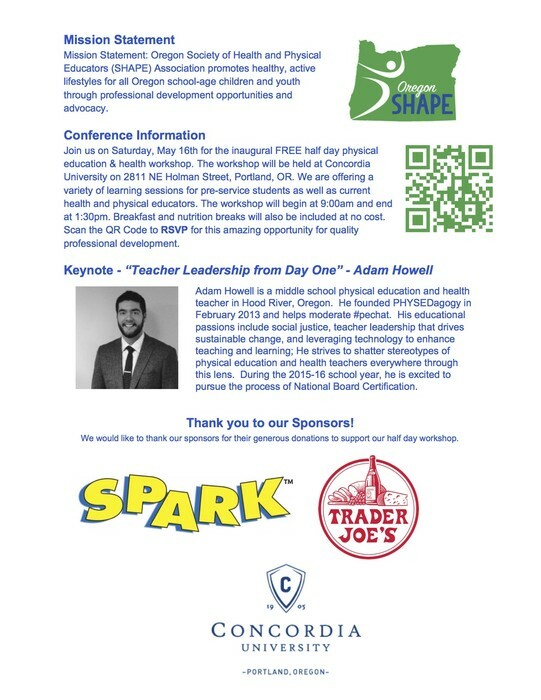 Below Naomi Hartl (@misshartl) and Collin Brooks (@CollinBrooksie) discuss ways to become a connected physical education teacher and find free professional development opportunities using a variety of social media platforms. Each month there are great professional development opportunities available to you at the click of a mouse! Amazing webinars are put on by many different associations across North America for you to access for FREE. We have listed a few upcoming webinars for the month of February for you to check out along with links to archived webinars. 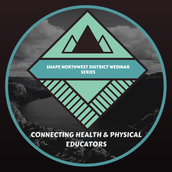 Get on Exchange to view SHAPE America's webinars-on-demand. Click here to access. 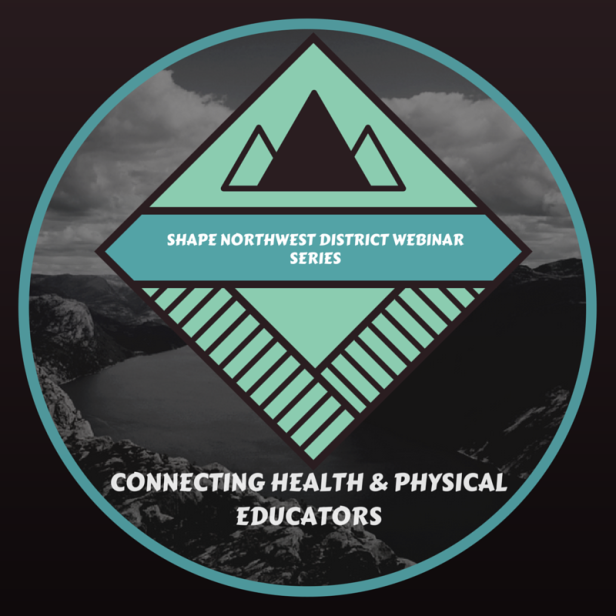 If you are a SHAPE America member the webinars are free for you! Link to register for this webinar! Register here for this webinar! Click here to view webinars past and sign up/register for ones in the future! This is a collaborative physical education project by Matt Pomeroy, Naomi Hartl, Collin Brooks, and Jonathan Jones. 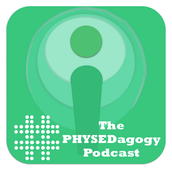 We are looking to showcase some of the best physical education teaching practices, lesson ideas, and epic events that #physed and #pegeeks across the world are doing at their schools. We will be interviewing teachers and they will be sharing the story about their lesson. They will also share materials so you can implement the idea into your physical education classroom. Subscribe to the podcast on i-tunes or Podomatic.